Very neat compact bright LED daytime lights. Fitted under mirror stalks and angled to the side slightly to give a better presence to cagers on side roads waiting to turn into my path who haven't seen either my headlight or my very bright LED fog lights facing forward. Hope these together with high visibility vests worn over my textiles and leathers keeps me rubber side up. Great service. Full email updates, prompt delivery and the lights work great. very bright and doing their job perfectly. Very happy. I ride a Hyo GT650 as a commuter bike, and have fitted the lights to my hand guards using one of the bolt holes, and they are positioned perfectly to create a huge triangle of lights in front. They are wired through relay to be on whenever the bike is running. Dave ****: "Great to deal with again. Excellent comms, excellent service!" Mike ****: "Clever mounting bracket made these simple to install (I mounted them under the mirror mounts on either side of my fairing). These are piercingly bright and a riding mate commented he can now see my bike coming from 'miles' away. Hopefully this will help stop the cagers pulling out in front of me." Mike ****: "Clever mounting bracket made these simple to install (I mounted them under the mirror mounts on either side of my fairing). These are piercingly bright and a riding mate commented he can now see my bike coming from 'miles' away. Hopefully this will help stop the cagers pulling out in front of me." ..
Dave ****: "Great to deal with again. Excellent comms, excellent service!" ..
Great service. Full email updates, prompt delivery and the lights work great. very bright and doing their job perfectly. Very happy. I ride a Hyo GT650 as a commuter bike, and have fitted the lights to my hand guards using one of the bolt holes, and they are positioned perfectly to create a huge triangle of lights in front. They are wired through relay to be on whenever the bike is running. .. 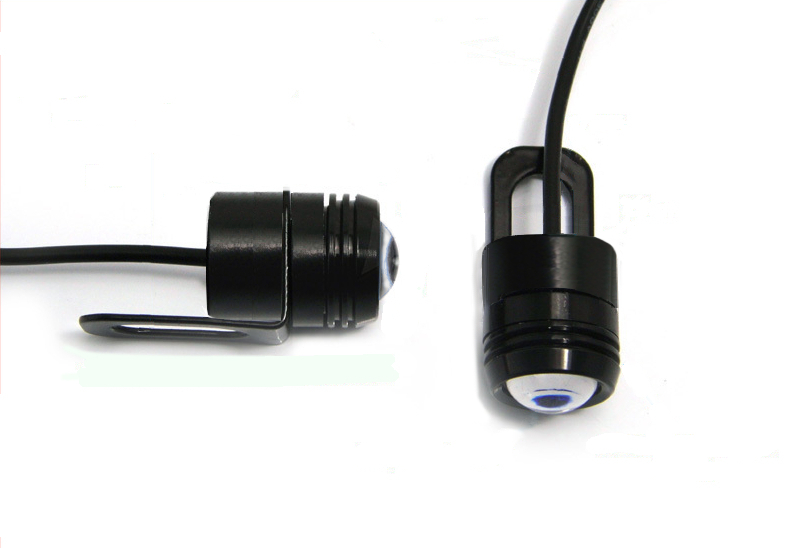 Very neat compact bright LED daytime lights. Fitted under mirror stalks and angled to the side slightly to give a better presence to cagers on side roads waiting to turn into my path who haven't seen either my headlight or my very bright LED fog lights facing forward. Hope these together with high visibility vests worn over my textiles and leathers keeps me rubber side up. ..